Tenants Say Landlord Has Lost It, But What Can They Do? Stephen Rex Brown The door to Martha Fedorko’s apartment. East Village landlords often make for easy villains. Just ask State Senator Thomas Duane about Benjamin Shaoul, the Shalom family, and Alistair Economakis. But the residents of 510 East Sixth Street face a particularly vexing situation. Stephen Rex Brown 510 East Sixth Street. By most accounts their landlord, Martha Fedorko, was once a generous owner and accomplished doctor who helped out tenants when she could. Luc Sante wrote all of “Low Life: Lures and Snares of Old New York,” in the building, and thanks her in the acknowledgements of the book published in 1992. “She was absolutely the best landlord I ever had,” said Mr. Sante, who now lives in Kingston, N.Y. But residents say that as she has grown old, Ms. Fedorko has started cutting their electricity for no reason, telling them to vacate their apartments at random times, menaced one of them with her cane, and left inscrutable letters in the hallway. But by February of this year the relationship had soured to the point that Mr. Connell had taken Ms. Fedorko to Housing Court for harassment, seeking an order to correct violations to the building code involving lead paint and missing window guards. 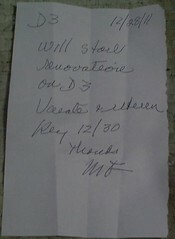 An order to vacate an apartment and return the key. The suit mentions 10 encounters between Mr. Connell, his wife and Ms. Fedorko. On January 17 Ms. Fedorko allegedly “battered and assaulted” him “with rolled up paper in the foyer of the building,” according to court documents. 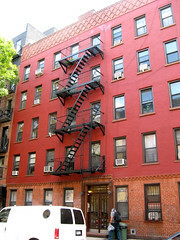 On many occasions, according to court documents, Ms. Fedorko “has screamed and yelled” at the couple “in their apartment and in the common areas of the building, hurling expletives and curse words.” She also allegedly “posted notices on the door to the apartment and the walls of the common areas of the building demanding” they “vacate the apartment and defaming the character” of them both. “She calls me ‘that Irish hooligan,'” said Mr. Connell, who is Scottish. In March a judge ruled in Mr. Connell’s favor, leading to $5,750 in penalties for Ms. Fedorko. She has also been charged $1,377 for violations related to lead in the building this year, according to Housing Preservation and Development records. The same records show at least 58 complaints this year regarding the property, most of them for no hot water or electricity. “In the last two years she has gotten totally wild,” said Frank Bardin, who has lived in the building since 1975. The examples are numerous. Mr. Bardin showed The Local video he had shot of Ms. Fedorko yelling at him and banging her cane against the stairs after he asked her to restore his electricity. Mr. Connell filmed her trying to barge into his apartment, saying that his newborn baby “has different color hair” — an apparent reference to her suspicion that he was renting his apartment out to different people. 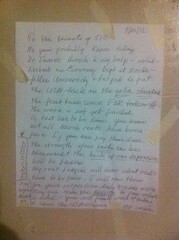 A note posted in the halls of 510 East Sixth Street, with a harsh response from the landlord at the bottom. 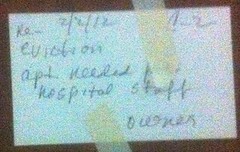 The two residents also said Ms. Fedorko does not always cash checks for the rent. Mr. Bardin, who now pays via certified mail, said that his rent for January, February and April hadn’t been cashed. For whatever reason, March went through, he said. Similarly Mr. Connell, in an interview in late April, said that his rent for November and December of 2011 still hadn’t been cashed. And one resident, who has since moved, said Ms. Fedorko rearranged her apartment on several occasions while she was not home, inexplicably putting her shoes in the trash and an umbrella in her bed. 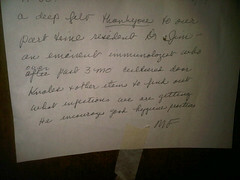 The note regarding Dr. James Hirsch. Another outlandish note refers to Dr. James Hirsch, “who helped establish an economic department at Rockefeller University and helped to put the USA back on the gold standard, the first time since FDR took office. The work is not yet finished. 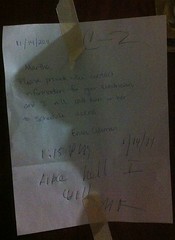 A test has to be done.” The letter goes on to note that not all tenants have paid their March rent. Mr. Hirsch is a recurring character in interactions with Ms. Fedorko, the three residents said. After some research, they concluded that she was referencing James Gerald Hirsch, “a pivotal figure in leukocyte biology” who died in 1987, according to an entry in the Biographical Memoirs by the National Academy of Sciences. Ms. Fedorko, who is listed as a graduate of the class of 1959 in an alumni newsletter from SUNY Downstate Medical Center, worked with him in the 1960s and 1970s. According to the biography, Ms. Fedorko contributed to Mr. Hirsch’s research in cellular biology and was an early expert in the use of electron microscopes. Her name appears in medical journals as recently as 2009, and the alumni newsletter says that she was a candidate for professorship who continues her research in lymphocytes, a type of white blood cell. Mr. Sante recalled writing next-door to Ms. Fedorko’s doctor’s office, where she treated mostly elderly Ukrainians from the neighborhood. When he moved into an apartment in the building she charged him $500, below market-rate at the time. “She explained that she was renting to me because she liked me. She said I was a nice, polite, clean person, and that she liked to have those type of people in the building instead of the loud partiers who would set the place on fire or whatever,” he said. The last time Mr. Sante saw his old landlord — who he guessed was in her mid-60s at the time — was 1992. Yet even with at least three videos of odd behavior, dozens of documented complaints and photos of notes from Ms. Fedorko it’s unclear what legal tactic the tenants could take to have Ms. Fedorko removed as landlord. Residents have considered trying an article 7A proceeding in Housing Court, which appoints an administrator for the building in the landlord’s stead. The problem is that the legal proceeding typically is employed against landlords that are neglecting the building. 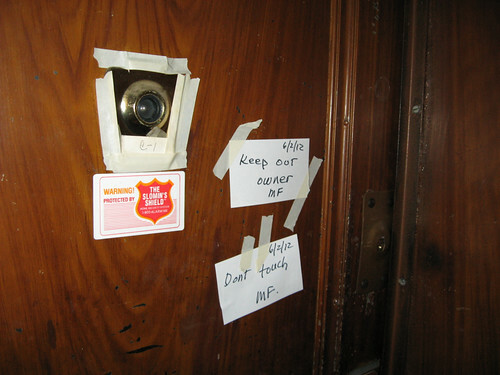 “Generally, cases that can be brought against landlords to remove them from active ownership have been based on general conditions — the building has not been maintained, fixed, and so forth,” said Wasim Lone, the director of housing services at Good Old Lower East Side, who is working with attorneys and with residents of 510 East Sixth Street who are considering legal action. But that’s not the case in Ms. Fedorko’s five-story building, which is in decent condition. And there’s also the fact that she lives in the building. “Then we got to deal with a pissed off ex-landlady,” Mr. Connell said. For now, residents are leaning towards a 7A proceeding, which, if successful, “maybe would set a precedent,” according to Mr. Lone. A former lawyer for Ms. Fedorko would not comment on his client, but did say that he was unaware of any family members that kept in touch with her. The same residents who say they are enduring constant harassment from Ms. Fedorko also know of no relatives to whom they can turn.